We have extracted the Managing Director’s letter from the circular of Cresta Marakanelo Limited, listed on the Botswana Stock Exchange under the share code CRESTA.bw. Cresta Marakanelo is a travel and tourism operator focused on providing hotel services to business travellers. 1.1. Cresta intends on acquiring Tribal Lot 141, Maun, (which operates as Riley’s Hotel) which it is currently leasing from BHDC, which is a subsidiary of BDC. BDC has a 27% shareholding in Cresta. 1.2.4. A portion of Plot 276 Selebi Phikwe, which operates as Cresta Bosele. 1.3. The transactions are therefore related party transactions as defined in the BSE Listing Requirements. 1.4. The BSE Listing Requirements require that shareholders of the Company, excluding BDC, approve the transactions. 2.1. The Company operates in the travel and tourism sector, with a significant part of the hotel portfolio focussed on the provision of hotel services to business travellers. In addition to accommodation, Cresta, as part of its services, offers customers restaurants, bars, safari tours, conference facilities, outside catering, as well as other ancillary business activities carried out from the Hotels. 2.2. 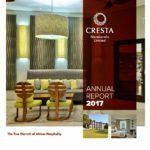 Cresta operates 12 hotels, 11 in Botswana and one hotel in Lusaka, Zambia. 2.3. In Gaborone, the Company operates Cresta Lodge and Cresta President Hotel, in Francistown it operates Cresta Thapama and Cresta Marang & Residency Hotels, while in Maun it operates Cresta Riley’s and Cresta Maun Hotels. In Jwaneng, Cresta operates Cresta Jwaneng Hotel, in Mahalapye it operates Cresta Mahalapye Hotel; in Kasane it operates Cresta Mowana Resort and Spa, while in Palapye and Selebi Phikwe it operates Cresta Botsalo Hotel and Cresta Bosele Hotel respectively. In Zambia, Cresta has a presence through its operation in Lusaka, Cresta Golfview Hotel. 3.1.1. The purchase consideration for the proposed acquisition of the BHDC Property is BWP25 million. The percentage ratio of the sale consideration to the market capitalisation of Cresta is approximately 11%. 3.1.2. The purchase consideration of the proposed acquisition of the LLR Properties is BWP235 million. The percentage ratio of the sale consideration to the market capitalisation of Cresta is approximately 106%. 3.2.1.3. the Competition Authority either approving the transactions, or confirming in writing that their approval is not required. 3.2.1.4. Cresta obtaining the necessary funding to pay the purchase consideration. 4.1. The transactions shall be funded by debt. 5.1. 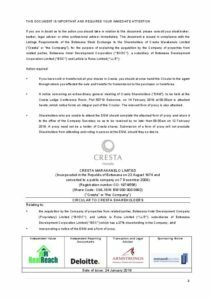 The Board believes that the future growth and sustainability of Cresta will be enhanced as a consequence of the acquisitions, as provided for in the Acquisition Agreements and recommends that Shareholders vote in favour of the ordinary resolutions necessary to approve and implement the Acquisitions. The director holding Cresta shares intends to vote in favour of the transaction. 5.2.1. Cresta will no longer be liable for the 8% annual rental escalations, which are adversely affecting the profitability of the Company. The rental increase for 2019 will amount to P2.5 million for the Properties, resulting in annual lease rentals of P34.1 million. 5.2.2. All the leases terminate in June 2020 and based on the current rental levels and the 8% escalations, the new lease rentals will be at unsustainable levels. In the absence of significant rental resets, Cresta will not renew most of the leases beyond the current terms, resulting in a decrease in operating hotels and cash generation, until Cresta either leases other properties or builds new hotels of its own. 5.2.3. Acquiring the Properties gives Cresta security of tenure beyond the remaining 18 month lease term and allows the Company to invest in refurbishing the hotels to defend and increase its position in the market. 5.2.4. The leases are “full repair and maintenance leases”, so Cresta is already incurring the costs of maintaining the Properties as if it were an owner. 5.2.5. Cresta has operated from these Properties for over 20 years and therefore has an understanding of the respective markets that they operate in. leased. The acquisitions of the five Properties will ensure that the Company has a balanced portfolio between leased and owned properties. The Company has not acquired any other properties in the previous three (3) years. The Independent Valuer applied an additional 30% portfolio/marriage value premium on the basis that the Properties will be acquired as a portfolio, however this premium has not been taken into account by the Directors. The directors consider that the value to the Company justifies the price to be paid by it. Loan facility with Barclays Bank of Botswana Limited, amount owed as at 31 December 2018 was P5,434,253. Based on the pro forma financial statements, net asset value per share will increase by P0,06 per share during the first six months after the transaction. Based on the pro forma financial statements, earnings per share will increase by 6.60 Thebe per share for the first six months after the transaction. This is primarily as a result of the reversal of the deferred lease liability relating to IAS 17 and the related deferred tax adjustment which is written back after the Acquisition. Excluding the once-off adjustments, earnings per share will decrease by 0.81 Thebe per share for the first six months after the transaction, as a result of the borrowing costs incurred for the Acquisitions. In the medium term, there will be an increase in EBITDA as a result of the reduction in lease rentals, however a reduction in earnings per share due to the increase in depreciation related to the Properties as well as the interest cost related to the funding of the Transaction. In the long term, once the debt related to the acquisition has been repaid, the earnings, cash generation and net asset value per share will increase. 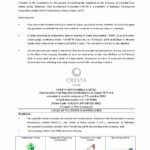 In so far as it is known to the Board of Cresta, the following Shareholders held more than 5% of the issued Shares of Cresta as at the last practicable date before printing of this Circular being 31 December 2018. 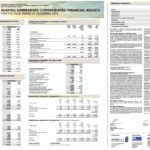 A copy of the Company’s audited financial results for the year ended 31 December 2017 and the unaudited interim financial results for the six month period ended 30 June 2018 is available for inspection at the Company’s Registered Office. There have been no material changes to the financial or trading position of the Company since the release of the unaudited interim financial results other than as disclosed above. The Board of Cresta is of the opinion that, after the Acquisition, and the assumption of debt to finance the same, the working capital of Cresta will be adequate for the Company’s foreseeable future requirements. None of the other Directors hold any interest in the share capital of Cresta. Other than as disclosed in this Circular or previous announcements to Shareholders, there have not been any other related party transactions. 18.2. Significant Contracts Other Than in The Ordinary Course of Business Other than as disclosed in this Circular there have been no significant contracts entered into other than in the ordinary course of business. The independent valuer, independent reporting accountants, sponsoring broker, legal and transaction advisor have each consented in writing to act in the capacities stated and to their names being stated in this Circular and had not withdrawn their consent prior to the publication of this Circular. The following documents are available for inspection at the Registered Office of the Company during working hours from 8.00am to 5.00pm. 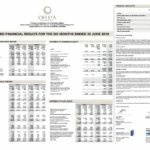 18.4.5. the audited annual financial statements of Cresta for the years ended 31 December 2015 to 2017 and the unaudited interim financial results for the six month period ended 30 June 2018. There are no legal or arbitration proceedings against the Company, nor, as far the Board is aware, are there any legal or arbitration proceedings pending or threatened against the Company which have had or may have, a significant effect on the financial position of the Company. The non-executive Directors of the Company were paid P674,043 in respect of fees in the financial year ended 31 December 2018. The Board is of the opinion that the terms and conditions of the Acquisitions to be entered into are fair and reasonable and will be to the long-term benefit of Cresta and its Shareholders. This is supported by the report of the independent valuer, which is Annexure 1 to the Circular. Accordingly, the Board recommends that Shareholders vote in favour of the ordinary resolutions necessary to approve the Acquisition Agreements of the properties. 18.8.1. The directors, whose names are given in the section entitled corporate information in this Circular, collectively and individually, accept full responsibility for the accuracy of the information given and certify that to the best of their knowledge and belief there are no other facts the omission of which would make any statement false or misleading, that they have made all reasonable enquiries to ascertain such facts and (if applicable) that this Circular contains all information required by the law. 18.8.2. The directors confirm that the Circular includes all such information within their knowledge (or which it would be reasonable for them to obtain by making enquiries) as investors and their professional advisers would reasonably require and reasonably expect to find for the purpose of making an informed assessment of the assets and liabilities, financial position, profits and losses and prospects of the issuer and of the rights attaching to the securities to which the Circular relates. A vote of a majority of the Shareholders present or represented by proxy at the EGM, is required to pass the resolutions as set out in this Circular. BDC and its associates, will not be taken into account in determining a quorum at the shareholders’ meeting and their votes will not be taken into account in determining the results of the voting at such a meeting, in relation to any resolution in connection with the related party Transaction. Signed by Mr Mokwena Morulane on behalf of each of the directors of Cresta. Cresta Marakanelo Limited operates in the travel and tourism sector, concentrating on the provision of hotel services to business travellers. In addition to accommodation, Cresta, as part of its services,… READ MORE.